2000 was a late cool vintage in Napa Valley and this wine has always been a beautifully balanced, subdued wine showing Cabernet Franc’s more herbaceous side. The nose shows rich aromas of rose petal, graphite, cedar, tar, green olive, cherry and grilled meats. Lush and lively in the mouth with a great balance between texture, tannin and acidity. It shows the whole range of flavors on the palate – a complex and delicious balance of herb, mineral, fruit and spice. Surprisingly this wine hasn’t changed much in the past few years which suggests it still has another 5 or more years of life. However, if you have this rare vintage in your cellar I would suggest trying a bottle now- it is stunning. Give it air – maybe 30 minutes to an hour in the decanter first as it takes time to wake up. This 15 year old wine. Recommended Drinking: now through 2020. This has long been a favorite vintage of mine. The Detert wines from 2002 are dense, rich and powerful and show off Oakville’s combination of supple texture and dense structure. A plush mouthful of mineral, tobacco, dark fruit, cocoa, menthol, and anise. Very complex and layered with a long powerful finish that coats the palate. Drinking beautifully and should continue to age for another 5 to 10 years. Aromas of black olive, tobacco, iron, grilled meat. Flavors echo in the mouth with olive, anise, cherry, cedar, cocoa. Complex layers of flavor and texture. This has developed beautifully, with a lush, supple texture and great length. Drinking wonderfully now and over the next few years – but I don’t think that this will be long lived. Recommended Drinking: now through 2017. This takes some time to emerge – so I would recommend decanting prior to drinking to allow the aromas and flavors to “wake up”. This was a fairly backward vintage on release with – dense and structured. Aromas of baking cocoa, dark chocolate, sage, mineral and dried roses. Dense and powerful but the structure has softened with age. The flavors are very savory, grilled meat, dried cherry, mineral, tobacco, tea and pretty floral notes of rose petal– very complex and long. Sausage, hints of blood and iodine, also stone fruit notes like plum and nectarine. This was a very tightly wound and tannic wine in its youth and still has a lot of tannin present – but really wonderful. Recommended Drinking: now through 2019. Pure and supple with classic flavors of dark cherry, sweet tobacco, dried herbs, mineral. This has a lot of density, richness and purity to it. Great lush texture that coats the palate. Really delicious and one of the most gracefully developed of the Detert Francs. Very sophisticated, supple, dense and long. Beautiful now, at a perfect drinking stage. Dried currant, caramel, coffee and cherry aromas. Nicely focused in the mouth with a core of cherry pie flavors; baking spice, vanilla, cherry and pie crust. Lush, rich and finely textured. Great balance of richness and sophistication. The finish echoes for a long time with dark fruits, provencal herbs and baking spices. Excellent – at its best now and over the next 5 years but should continue to age through 2024. Aromas of dark cherry, bittersweet chocolate and anise. Wow! Dense rich and intense with dark cherry, black berry, tobacco, baking cocoa, fennel, anise, baking spices, liquid mineral and layers of flavors that unfold over the long complex finish. This has tremendous concentration and richness. Distinctive and utterly delicious now but probably hitting its sweet spot in 2015 to 2020. Should drink beautifully for another 10 years after that. A late cool vintage that has always shown off the floral/herbal side of Cabernet Franc. This wine has beautiful aromas of sweet tobacco, sage and anise. This sings texturally, with layers of silky tannin unwrapping to reveal delisious flavors of fresh cherry, cocoa, anise and mineral. Certainly the most silky and approachable of the wines in this age range, but with such fine balance that I expect this to age well for another 15 years. Sweet spot for drinking is now -2020 maybe longer. But will certainly continue to drink beautifully until 2024. Mouth filling and luxuriously fine, silky tannins. Lush and decadent with a sweet core of fruit and dense but soft tannin structure. This is showing bright red cherry liquor, vanilla, toast, carmel and cocoa. Tobacco, cedar, olive and dark cherry in the mouth. Silky but present tannins. This wine is very open and accessible now and will continue to evolve in the short term. I would err on drinking this delicious Franc now and over the next 5 years although it may continue to age further. Powerfully aromatic with a fruit driven nose of black berry, plum and hints of nutmeg and vanilla. Rich sensuous mouthful of stone fruits, dark chocolate, currant and background notes of anise, tobacco and minerals. Long and textured with sophisticated tannins framing the finish. While delicious now, this Cabernet Franc will show even more richness and layering with a few years in the cellar. Aromas are pure and focused showing violets, black cherry, baking cocoa and sage. Broad mouthfeel with wonderful richness and density. Flavors of dark chocolate, cherry and anise unfold and persist on the long sophisticated finish. This wine is a baby with great concentration and depth. This vintage shows classic Detert Cabernet Franc aromas of baking cocoa, mocha, cassis, anise and sage. Full bodied with mouth filling richness and wonderful texture that is both lush and dense. Delicious flavors of dark cherry, blackberry, anise and notes of mineral and baking spice. The long finish echoes dark fruit flavors and again shows off the rich soft texture of this wine. Gorgeous aromas of dark cherry, black berry, violets and vanilla are the lead-in to a powerful, dense and lushly textured wine, overlaid with classic Detert Franc flavors of baking cocoa, cassis, sage and mineral. Incredible concentration while remaining fresh, lively and sophisticated. The tannins are both powerful and elegant and draw out the long, flavorful and impeccably detailed finish. A long life ahead and at its height from 2020 to 2030. Displays the classic Detert aroma profile of graphite, black cherry, currant, espresso, bittersweet cocoa, and dried herbs. Supple, powerful and energetic in the mouth, revealing a complex range of flavors including cherry, baking chocolate, dried lavender, anise, mineral, graphite and black olive. Finishes very long with refined tannin and intricate flavors of dark fruits, flowering herbs, baking spice and sandalwood. Delicious. This wine has always been a stunner. From old vines on our cousin's property (H for Horton) which is contiguous to Detert, this is a classic Napa Valley Cabernet with incredible density, richness and supple texture. Similar profile to the 2002 Cabernet Sauvignon above but turns up the intensity of flavor on an even smoother texture. Lots of mineral, tobacco and olive notes laid over currant and black cherry. Truly a special wine with an old-school flavor profile and structure. We made only one barrel of this so not many bottles have gotten around. This is also throwing a lot of sediment -worth standing the bottle up for a day or two and then decanting off of the sediment before drinking. Recommended Drinking: now through 2025. A little plusher and showier than the Cab Franc with a sweeter core of fruit. But also driven by savory herbs, grilled meat, dried stone-fruit. Shows a wide range of complex bottle age characteristics of herb, tea, dried roses and dried fruits. Pretty compelling now and I’m not sure of the longevity. This is 10 years old now and I would drink now and over the next 5 years. Great texture and richness. Dark notes of black cherry, mineral, sage, dried herbs and stone. Nice density and persistence. Fine grained tannins and good richness but not as dense and sophisticated as the Franc. A sleeper vintage, which on release was tightly wound and not revealing much aroma, texture or flavor. That has changed! Nose of dark cherry, violets, cherry blossom over a stony, minerally layer that also echoes Provencal herbs and grilled meat. Great balance in the mouth with wonderfully smooth texture and flavors of dark cherry, cocoa, mocha, licorice and fennel. Sweet tobacco, black olive, floral and dark cherry notes linger for a long time on the finish. Delicious. Still a young wine; while it has developed some beautiful secondary characteristics from bottle age and has softened, it has the richness, density and structure for another 10+ years in the bottle. But I’d say the sweet spot for drinking this is now through 2020. Beautiful layers of cherry liquour, dried herbs, currant and olive aromas. This is a satisfying Cabernet now with supple, open texture and flavors of mineral, toast and cherry. Long and smooth in the mouth with lush tannins and lingering flavors of herb and cherry on the finish. Delicous now and over the next 5 years. Dense, rich and delicious. This is a real crowd pleaser with a silky texture and wonderful combination of dark cherry, black berry and cocoa flavors as well as black olive, tobacco and tapenade. Long and framed on a beautifully dense and lush structure. Great balance and purity. Beautiful wine that is drinking well now and may continue to improve but probably should be enjoyed now and through 2019. Dark berry, plum, cocoa, violet aromas. Rich, dense and powerful in the mouth, with a long, sweet, dark-cherry entry and a dense core of fruit over a lush texture. Mineral, toast, vanilla, cherry, sweet tobacco and cedar flavors play out over the extremely long finish. This wine is a baby –fresh and lively with great density and richness and very fine-grained tannins. It will soften and become more expressive with a few more years in bottle. Delicious now, but great things ahead. I think the sweet spot for drinking is 2016-2025. 2010 Cabernet Sauvignon – Beautiful nose of dark berries, stone fruit and floral notes. Dense dark and concentrated showing cassis, currant and baking chocolate flavors with subtle layers of black olive and mineral. Densely structured and wonderfully textured. This too is drinking beautifully now with decanting but will continue to improve over the next decade. Beautiful nose of sweet blackberry, black cherry and mineral notes. On the palate, there is a great range of flavors from dark berry to savory herb and tobacco. Finishes with black berry and baking coca flavors over a mineral-driven background. 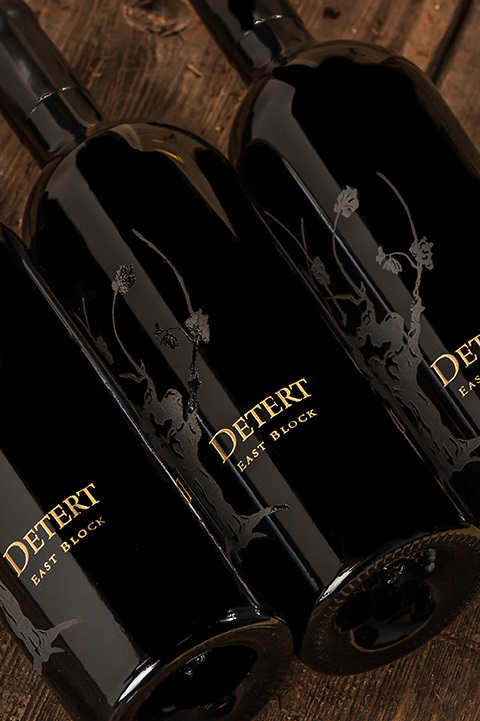 The 2014 Detert Cabernet Sauvignon displays an enticing range of dark cherry, cassis, coffee, savory herb and tobacco aromas. The palate is seductive - rich, dense and concentrated revealing flavors of berry and cassis layered with notes of baking cocoa and hints of black olive. Dense, textured and layered. "Blackberry, graphite, herb, currant and cocoa powder aromas are seductive. Powerful and plush in the mouth with a dense, textured core of dark fruit, herbs and minerality. Very fine grained and elegant tannin frames a complex, stylish and long finish." Beautiful, lifted aromas of cassis, plum, dark berries and herbs fruit. On the palate, shows wonderful balance between concentrated richness and lively, fresh flavors. Layers of bittersweet cocoa, plum and berry flavors transition to complex stone, mineral and herb notes. Super long, lingering and complex finish with sophisticated, integrated tannins. Classic, elegant, powerful and true to site. This shows a complex core of black currant, anise, espresso and baking chocolate. Delicious dark fruit, mineral and savory herb flavors carry across the silky palate. Fine grained tannins frame the long, layered and sophisticated finish. A beautiful wine. Beguiling aromas of black berry, dark cherry, cocoa, baking spice and herbs. Very dense, and powerful but also impressively pure, lush and polished in the mouth. A beautiful range of dark berry flavors are framed by complex anise, black licorice, hints of espresso and mineral notes. The finish is extremely long and flavorful and framed by graceful plush tannin. A classic Detert East Block that will drink well from 2020 to 2035.